John Hovis's Wee Tennis Balls: Davis Cup. Following an enjoyable weekend of Davis Cup action, there are a few comments to be made. Firstly, it is sad that the first round has to follow on so closely from the first slam of the year. The severe physical demands of the modern singles game mean the top players are almost guaranteed to miss out. A tipping point has now been reached; should two out of the top five withdraw, the others are surely to follow, such will be the perceived wisdom. Handing out advantages early in the season is not to be recommended. Clearly, the Davis Cup has become a poor relation in the tennis calendar over the past few years. The top-level absenteeism has ensured a rapid deterioration in the status of the tournament in recent years, yet popularity is not necessarily on the wane. Davis Cup has now become an opportunity for lesser lights to shine in the pursuit of playing for their country. It provides an excellent (and usually cheap) way for provincial areas to get a hold of top-level tennis. The format is enjoyable, often leading to a winner takes all final session rubber. It affords doubles players to bond with singles players and allows tennis to absorb some of that 'football crowd' mentality and hysteria, particularly in the latter round ties. Unless the sport changes to provide a less crowded calendar with longer recovery periods, the top names will continue to boycott, at least until the more important ties. Spain's players are the latest to turn their backs on the trophy; although Canada played great stuff to win (a win which was reported on the front page of Canadian papers) the sheen is tarnished by the fact that Spain were heavily weakened. Does it matter? Perhaps not. The tournament will always have its place and the current re-positioning of Davis Cup is quickly evolving by necessity. John Hovis would suggest some changes to the format which could help stop the slow degradation. Reduce singles rubbers to best of three sets, except the final. Ensure no players in the first day singles play in the doubles. Reduce the tie to two days, with doubles starting the second day's session. An eleven or twelve start on day one, couples with a slightly later start on day two would allow 24 hours for singles players to recover. Talking of marathon matches, here's another pic from Cilic v Querrey from Wimbledon 2012. Copyright John Hovis. There are some other changes I would make to the format, key amongst them being a bye for the holders who don't get much time to enjoy their success! There are other discussions to be had, perhaps getting rid of the Fed Cup and making the Davis Cup a male+female tournament, perhaps with six singles and three doubles rubbers. 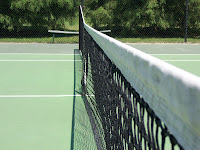 Imagine a three day event, just as it is at present, with three best-of-three singles on day one, one best of five men's doubles, a best of three women's doubles and a best of three mixed doubles on day two, with three more singles on day three. Bang, crash, wallop. True team tennis for a modern age. Back to the current Davis Cup. Fantastic tie between Switzerland and Berdych. I love Stan and can't stop feeling sorry for him. Hopefully this doesn't negatively affect his season. The doubles tie was madness, although I can't help but think matches really shouldn't last that long; what tends to happen is that players begin to focus on conserving energy for their service games. Subsequently, the tennis becomes staid as players refuse to expend energy attacking. Final set tie breaks are probably the right way forward across the board, much as it pains me to say it. Tennis shouldn't be about crazy acts of stamina and stubbornness It isn't 'Touching The Truck'. And finally. My Davis Cup prediction? France. That's France's chances utterly scuppered. Any idea what the schedule will be for Davis Cup in Boise. What time do matches start and how late Sunday will they go?